I'm so excited to start our very first FABULOUS FRIENDS WEDNESDAY with someone we've admired so much! Craft Envy friends, say hello to Kim, from 733!!! Thanks Kim for sharing your talents with us today. You guys should definitely check out her awesome blog! 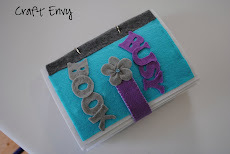 Hello to all of you wonderful Craft Envy readers! 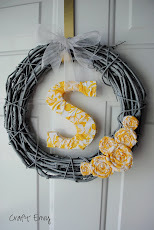 These two ladies are so fabulous and I was so excited when they asked me to guest post today! So a little about myself: My name is Kim and I blog over at seven thirty three - - - a creative blog. We have lots of fun over there, so come check us out! There is lots to see - every Thursday we have What are little boys made of? Weekly Round Up and every Friday is Fun Feature Friday. I also offer help with blog design and layout, so if you are in dire need of a button, header or other design element, I'm your girl! What types of crafts do I do? All kinds! 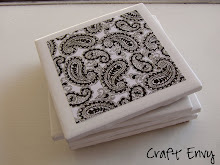 Check out my creative ideas page for all of my tuts and original ideas, as well as my take on other crafty projects. I also offer up fun freebies from time to time, my most popular being my Weekly Meal Planner. Enough about me - Lets get on to the tutorial! 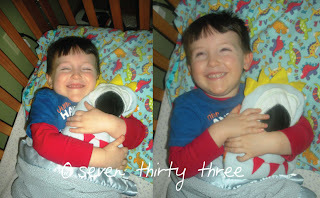 My oldest sleeps every night with a rice pack I made her a while back. She loves the warmth and snuggles with it. I decided it was time to make one for my middle child so he could snuggle up too. 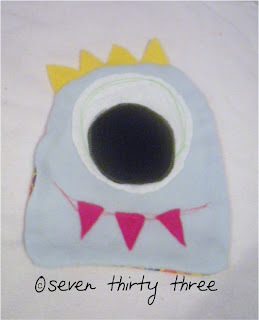 I ended up using scraps of fleece, flannel and felt that I had around the house. 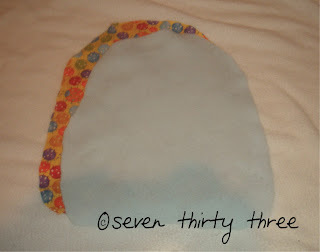 I find that fleece is a good fabric for these because it provides a moist heat. I free cut my shape - I wanted it more of a "blob" monster so that the rice can be evenly distributed when it is laid flat in the microwave. 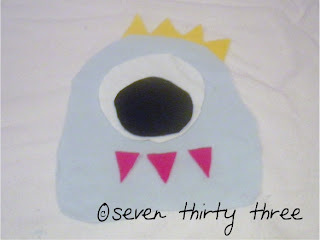 Next I cut out all of my embelishments, white circle for the eyeball and a smaller black circle for the pupil. 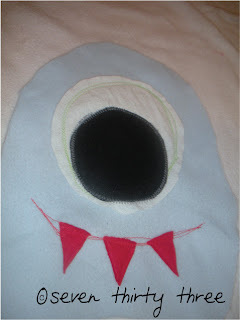 I also cut out three red fangs and yellow spikes for the head. I laid them out on the monsters body to make sure it would all fit. Here is when you pin it if you are inclined. I, personally, didn't want this to look perfect, it is a monster you know! So I just winged it. After adding the appliques I put the two pieces of fabric wrong sides together and straight stitched all the way around, leaving a 3" hole in the side to fill with rice. 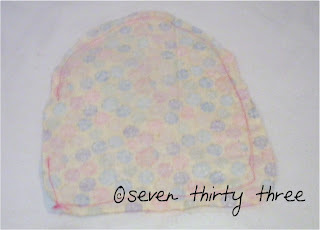 I then used a zig-zag stitch over my straight stitch to ensure a secure hold and not allow any rice to wiggle out! Fill with rice (I rolled up a paper plate to make a funnel and poured the rice through it into the monster) and voila! You have a little monster rice pack! Depending on the size of your monster you heat it for 1 - 2 mins in the microwave. Test yours out, starting with a lower time and adding more time until you get the perfect temp. These can also be used as cold packs by sticking them into the freezer. They don't stay cold long (30 mins), but for a little one that is usually all that is needed! 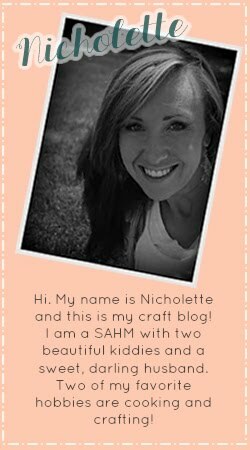 Thanks again Vanessa and Nicholette for letting me hijack your blog today!